Tag Archive | "El Nuevo Dia"
We woke up today (June 4, 2009) to the magnificent news that EyeTour was featured on El Nuevo Día, Puerto Rico’s best-selling newspaper. 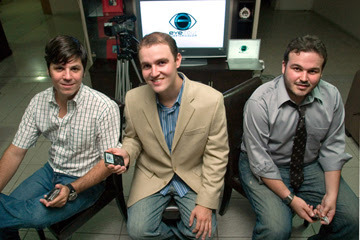 The article celebrates EyeTour.com’s recent Best Website WebAd Award 2009 victory in the Sales and Marketing Executives Association of Puerto Rico yearly Internet Forum event. If you have a hard copy of today’s paper on hand, turn to page 41. If you don’t, you can read the news here (link in Spanish). We’ve also prepared an English version of the article for non-Spanish speakers. We want to thank once again the entire team for all their hard work and dedication to the project: Pablo, Adrián, Gabriel, Sherman, Danette, Mariano, Gerardo, Andrés, Jacob, our friends at the Puerto Rico Tourism Company, Rums of Puerto Rico, Comercio y Exportación, INTENE, Grupo Guayacán, CompraoAlquila.com, ML Studio, and all the others who’ve allowed us to make our vision a reality. It is because of them that you are able to sit back, relax, enjoy EyeTour videos and BE YOUR OWN GUIDE! Also, we want to thank all of our Facebook fans and especially the Twittericans, who’ve shown their overwhelming support for the project since EyeTour opened its account a few months ago. Thanks for all your kind words, motivation, and support! We hope to celebrate and share many more victories in the near future with all of you! EyeTour in Puerto Rico’s El Nuevo Día newspaper! If you live on the Island, grab a copy of today’s (Wed., Sept.12/2007) ‘El Nuevo Día’ newspaper and flip right to ‘En Punto’ to read about the EyeTour project and team. You can also read the story by clicking here.